Moon picture taken on January 25th, 2007. 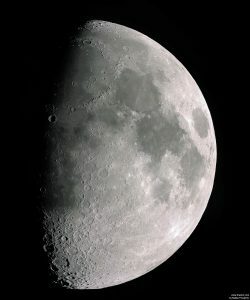 The waxing gibbous Moon is very nearly full and illuminated generally from the right. By that time the gibbous Moon is well above the southeastern horizon. The Moon is in this phase for nearly a week between first quarter and full. Just a day or so before Full Moon the waxing gibbous Moon appears nearly full and might be mistaken for a full Moon.